Trichoderma asperellum formulations for larger, healthier and more effective root systems. Eco-T and Eco-T Ezi-Flo are the essential first step to integrated management of root diseases. Control of Root rot disease caused by e.g. Fusarium spp. Pythium spp. Rhizoctonia spp. and Phytophthora spp. Increased root growth due to increased auxin availability. Increased nutrient mobilisation due to mineralisation of nutrients. Reduces plant stress due to activation of Systemic Acquired Resistance (SAR).Refer to ‘How does Eco-T work’ for detail on SAR. 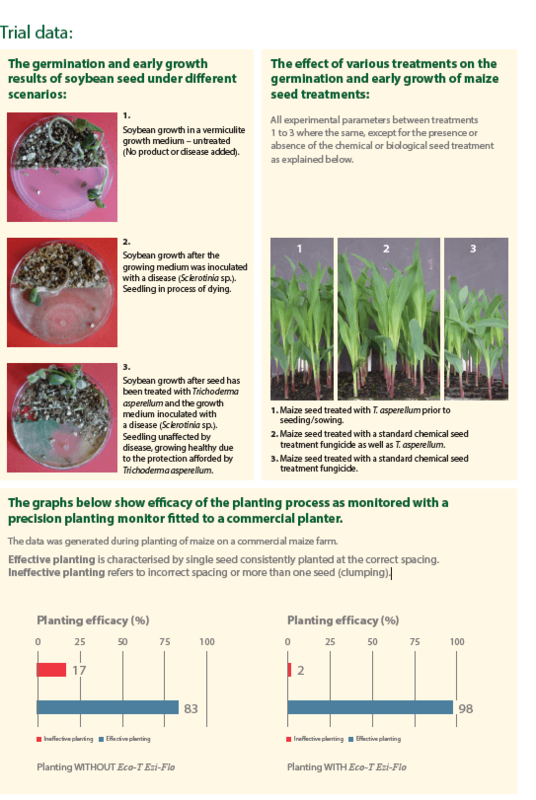 Strengthens disease control program and compliments chemical fungicides in an IPM approach. 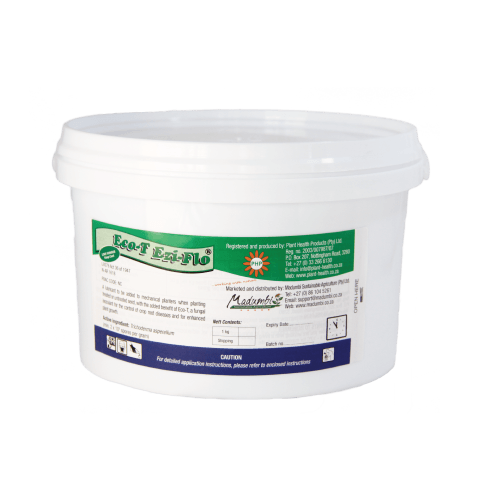 Ideal product to apply after soil sterilization. Treated root systems are denser, well developed and more extensive. Larger root system ensures more efficient contact with nutrients. Maximises the nutrient uptake efficiency and therefore helps to ensure the biggest return for the money spent on fertilizer. Increases tolerance levels of abiotic (e.g. drought) and biotic (e.g. disease) stress conditions. These formulations enable the grower to apply the product as a seed treatment, in furrow, or as a soil drench on a wide range of crops. User friendly 250 g or 1 kg (Eco-T) and 1 kg or 4 kg (Eco-T Ezi-Flo) containers with relevant measuring scoop included. The Ezi-Flo formulation consists of talc and graphite at an optimal ratio specifically for use in both mechanical and air assisted planters. Eco-T Ezi-Flo regulates the ow of seed ensuring correct spacing and planting of single seeds due to lubricant e ect of the talc and graphite. This ensures uniform planting density which can contribute to reaching optimum plant potential. Trichoderma asperellum, the active ingredient in Eco-T, is a beneficial fungus that forms a symbiotic relationship with plant root systems offering the plant numerous benefits. T. asperellum is aggressive, fast growing and quickly colonises a root system, out-growing fungal pathogens and out competing these pathogens for space and nutrients in the root zone. T. asperellum parasitizes other pathogenic fungi by coiling around the pathogen hyphae, constricting and penetrating (via enzymatic secretion) eventually destroying it. T. asperellum activates SAR, a state of enhanced immunity to infection demonstrated by plants following an initial localized injury or presence of inducer organisims like T. asperellum. In response the plant produces certain substances that, over time, evoke resistance throughout the plant.